The five-star hotel and condominium project that's planned for the parking lot near the Charleston City Market has passed its first major test from the city. The Planning Commission unanimously voted last week to grant the zoning changes to allow the 115 rooms that are planned and a height of up to four stories, which is actually less than some of the nearby buildings. The developers plan to ask the Board of Architectural Review for another half story, which BAR could grant "based on architectural merit." But first comes an appearance before the Board of Zoning Appeals, which must grant a special exception for an accommodations use. The property has been zoned for two 50-room hotels for years. The city abandoned a right of way that ran through the middle of the lot, creating a single parcel. The planning commission rezoned the parcel for 150 rooms, since there is no zoning for 115 rooms. Weighing in the project's favor is the fact that the Historic Ansonborough Neighborhood Association is supporting it after signing a binding agreement with the developers specifying the details. Robert Gurley with the Preservation Society of Charleston said he didn't like the idea of rezoning the property for that many rooms, despite the agreement. Somera Capital Management, which is headquartered in Santa Barbara, Calif., and has an office in Washington, D.C., that has been involved in Charleston, bought the one-acre lot from First Baptist Church in 2013 for $15 million. Geyer Morris of Atlanta is the development partner. The architect is R.M. Stern Architects of New York, which also designed Courier Square at Meeting at Columbus streets. Courier Square is owned by the parent company of The Post and Courier. The principals have said their vision is to create a hotel in Charleston that was on par with a Four Seasons or a Ritz Carlton. 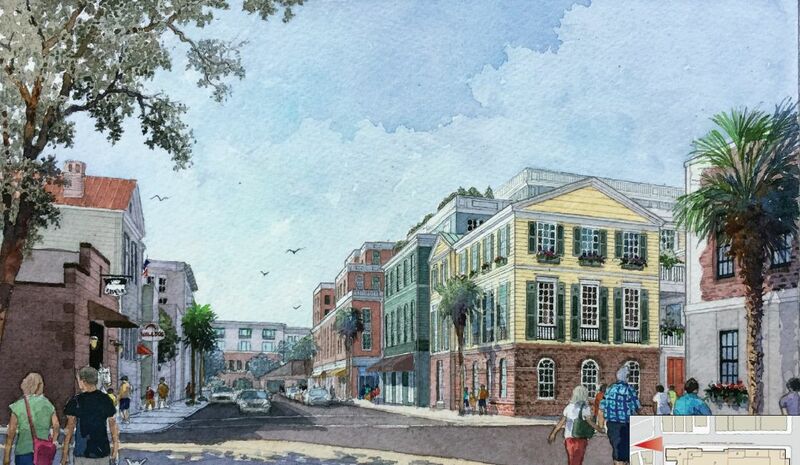 The condominium units would be in several buildings along Pinckney Street, the north end of the site, and would be patterned after Charleston single houses. Shops would front North Market on the south and a pedestrian arcade and courtyard in the middle of the site. Parking for the hotel and shops would be underneath the hotel. The city has been studying how to replace the 84 parking spaces that will be lost. The developer of a new hotel and conference center in Wild Dunes Resort has recruited a partner as site work begins. Lowe, which also developed the four-star Boardwalk Inn near the site of the new facility on the Isle of Palms, is working with Third Palm Capital, according to an announcement last week. Third Palm is providing financing for the 153-room hotel complex that will also include a conference center, café pool and spa. The partners called it “a significant capital investment” but declined to disclose the amount. Third Palm Capital is also Lowe’s partner in the 225-room hotel planned by Charleston’s Waterfront Park, currently the headquarters for the State Ports Authority. Site work on the Wild Dunes project started the first of August just inside the Palm Gate at the eastern end of Palm Boulevard. The new hotel is expected to open in late 2020. At least one neighbor expressed concern seeing all the trees that are being dug up. Interim City Administrator Desirée Fragoso said it’s all in the plan and in accordance with the city’s tree ordinance. • Remove and replace 143 palm trees. • Remove and replace 38 significant trees, including 24 live oaks 8 to 16 inches in diameter. • Relocate six historic oaks. • Remove three historic trees that were determined by an arborist as not being healthy enough to survive being transplanted. The West Ashley Cambria Hotel near the Ripley Point Marina is about ready for its exterior finish. Charleston's Design Review Board was scheduled to look over mockup panels of the exterior on Monday. The board could either give the go ahead or require some changes before proceeding. Construction on the 126-room property at 84 Ripley Point Drive started last September. The developer is Holy City Hospitality LLC, an affiliate of RREAF Holdings of Dallas, Texas, that's not affiliated with a Charleston firm with the same name. The owner is listed as Upland Real Properties LLC and the architect as Goff D’Antonio Associates.